Goji berries are little health boosters that can be added to almost anything! Boasting fibre, iron, antioxidants, vitamin C and A, goji berries aid weight loss and improve the immune system. 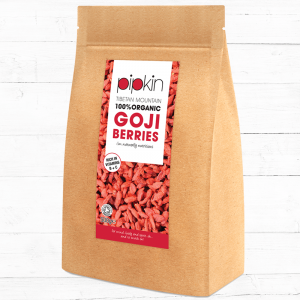 Pipkin’s goji berries are bigger than average so they contain more Lycium Barbarum Polysaccharides, which is the anti-ageing antioxidant for liver, kidney and eyes.